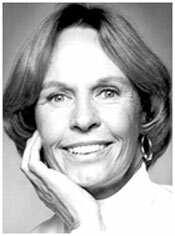 Donna Hall worked as a freelance stuntwoman for over 40 years. She’s one of the few women in the history of motion pictures and TV to have driven and chased four and six-up teams. Donna came from a rodeo family and grew up around movie sets where her Dad, Frank “Shorty” Hall, worked as a jockey and stuntman doubling for such stars as Marion Davies and Mary Pickford. Donna knew she wanted to be a stuntwoman during her first job at the age of eight when she was recommended for a riding gig on “Little Miss Adventure”. She rode a thoroughbred horse out of the starting gate and did chases around the track. She worked once more at age 10 but didn’t do any more movie work until after high school graduation from Burbank High in ‘46 when her stunt career started in earnest. She worked with Clarence “Fat” Jones, a famous livestock supplier with 300 head of motion picture horses. 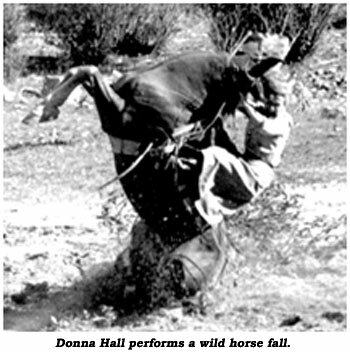 Her love of riding and experience with horses allowed Donna the opportunity to work in the many westerns and TV shows Hollywood used to crank out. It was the best teacher Donna could have to perfect her profession. She did transfers to trains, stagecoaches, wagons and jumps between teams. If this wasn’t enough, Donna did saddle falls and bulldogs. Donna’s mentor was the great stuntlady Polly Burson, and she’s acknowledged she learned a lot from Polly. You see, when Donna started out in the stunt field, there weren’t stunt co-ordinators like we know them today. Stunt people had to rely on other stuntmen to help them out. Donna really enjoyed working on the Gene Autry produced “Annie Oakley” with Gail Davis. Doing two shows a week, Donna had the opportunity to do many stunts, including Annie’s opening—standing-on-a-running-horse-and-firing at a hand held target. Donna attributes her 40 successful years in the business to luck and good timing. She was lucky enough to work during the golden era of westerns. When Donna was not working on a movie set, she’d perform trick riding at rodeos in Boston, Detroit and Madison Square Garden. Donna’s riding skill was seen by crowds of 110,000 people at the biggest rodeo ever at L.A. Coliseum. Some of the many stars Donna has doubled include Doris Day, Barbara Stanwyck, Joan Collins, Judy Garland, Jane Fonda, Debbie Reynolds, Shirley Temple and Ginger Rogers. Truly a pioneer, Donna Hall, one of the founding members of the Stuntwomen’s Association and married ot top wrangler Jay Fishburn, has taught hundreds of actresses and actors how to ride. Her equestrian expertise can be seen in such films as “Sand”, “Cat Ballou”, “Little Big Man”, “Long Ride Home”, “Cheyenne Autumn”, “The Rievers”, “Calamity Jane”, “Maverick Queen”, “From Noon To Three”, “Annie Get Your Gun”, “Big Country”, “Westward The Women”, “Outcasts of Poker Flats”, “Rare Breed”, “How the West Was Won” and “The Violent Men”. She’s also stunted on almost every TV western series ever on the air: “Kit Carson”, “Cheyenne”, “Have Gun Will Travel”, “Wanted Dead Or Alive”, “Lone Ranger”, “Buffalo Bill Jr.”, “Zorro”, “Sugarfoot”, “Gene Autry”, “Wyatt Earp”. One of the best, Donna Hall succumbed with complications from pneumonia at 74 on August 7, 2002.